Mike Marshall has built a truly comprehensive video library with hundreds of mandolin lessons covering many musical styles. Mike's students enjoy unlimited access to his mandolin lessons online, as well as tablature and mp3 play along tracks. 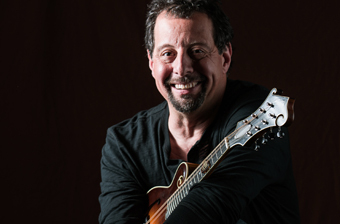 Learn how to play the mandolin from a legendary acoustic musician. What ultimately sets these mandolin lessons apart from other offerings is the ability to submit a video for review using the ArtistWorks Video Exchange Learning® platform. Mike reviews each submission and records a video response, offering specific guidance to take your playing to the next level. All students can access the Video Exchange library and watch each other’s interactions with Mike. This library is constantly expanding and may contain the key to unlock your playing. For more than 35 years, Mike Marshall has set a new standard for American acoustic music, with a breadth of talent that spans mandolin, guitar, violin, and mandocello. At age 19, he left his native Florida to pursue music, eventually joining the David Grisman Quintet in the Bay Area. Since those early days, Mike's historic career has spanned hundreds of recordings and taken him on tour around the globe. He has also received numerous credits as a composer, producer, and featured musician. You can hear his iconic mandolin playing on the theme for NPR's 'Car Talk', as well as the San Francisco-based radio show 'Forum' on KQED Radio. Today, Mike and his wife Caterina Lichtenberg both teach mandolin lessons at ArtistWorks. “Bei Mir Bist Du Schon” -NEW! “Sleigh Ride” by Sam Bush -NEW! What can you say except...there is nothing else like Artistworks. I am amazed at how into teaching these geniuses are. Mike Marshall’s site is brilliant and Dave Stryker has been an inspiration. I do miss Chuck Loeb but your “replacement” in Mr. Stryker has blown me away! Artistworks has been great. I came to artistworks as a beginning Mandolin player and have found it to be extremely helpful and that my playing has only progressed as far as it has in a short time due to the content available. Both my father and brother have recently signed up after my continuous praise and I recently signed up for a second course for guitar. I could not recommend it more. Also the the chance to get to personally connect with your musical idols is amazing. I have been enjoying mandolin lessons on line for years and love it. I have recommended Artistworks to many of my musical friends. A great way to learn! I have been an enthusiastic member of both Bryan Sutton's and Mike Marshall's schools for some years now and remain convinced that this is a most effective way to develop as a player. Both Bryan and Mike are excellent teachers and it's a privilege to be taught by two such great players. You can learn at your own pace and the students are most supportive and come from all over the world, another nice feature of the programme. I find that being a member of both schools keeps me motivated and eager to progress. I have been a member since this began. My wife gifted me a three month membership and I immediately signed up for a year and have automatic renewal. I have also gone to two Global Mandolin Summits as a result. One in Benecia California and just this past June in Sicily! So much good info just watching Mike's breakdown of submitted videos and all of the lessons in every level are great. Can't do without it. There is something for every level of player. I've been extremely pleased with ArtistWorks. Artistworks is one of the best online learning platforms anywhere. It is a responsive learning system that allows students to learn at their pace, get feedback from their teachers, see what other students are learning and has one of the best support staff groups i’ve ever worked with. I am very pleased with what i’ve learned from Mike Marshall in the Mandolin School. I only wish I had more time to play and stuff! Thanks for all of your hard work making this a reality! I’m a mandolin player and I find the ArtistWorks website to be an unbelievable resource : great instruction, extensive library of lessons, videos and music you can learn from. I can find almost any song I’m thinking of learning in their library, and If I’m ambitious enough I will send a video to Mike for feedback. Mike is so enthusiastic about you and your learning that it’s hard not to be inspired. With such an extensive musical background, Mike’s feedback is always insightful, incisive and ultimately useful in promoting progress in your musicianship. I've been following them for five years, and they just keep getting better. If they teach your instrument, almost any resources you'd want, you can find here, with a great community of folks willing to help. The best! The possibilities for growing your musical skills are limited only by how much you put into it. ArtistWorks rules. I just wish that I could go back over older lessons on the mandolin. Love the ability to print the sheet music. I love this site. Mike Marshall is a great teacher and the additional tune selection always keep the site fresh. I'm also learning a tremendous amount from the theory class. I have recommended this site to anyone who asks me about lessons. Great site! What a great community of all levels, and what great karma for the elite instructors offering their time to share their personal expertise. If you hang out here, you will become a better player by osmosis, the site is THAT good. Excellent service, people obviously in love with what they do, and an endless, growing, encyclopedia of technique, ideas, and tunes. I mean, how often do you get to casually name drop at your next jam session, "Mike Marshall is my mandolin teacher", or "Tony Trischka was just showing me......" The curriculum is a no nonsense, extremely well thought out, roadmap from forming sound basics to professional level. Highly recommended. I've been very happy with the overall artistworks experience. Great reliable service that provides wonderful features. Tons of resources to get you running. Even if you don't use the artist video exchange you've got what you need to succeed. I have not found a better way to take lessons. The cost is reasonable and the access is unlimited. The only thing holding you back is the time you want to invest.. I've been a student for 2 years now. The self-paced instruction, from world renowned musicians, is second to none. The total access to all of the lessons and training material means that I can learn at my pace, and fits my schedule. The personal video exchanges are fantastic. My instructor has been both encouraging and challenging, focusing on the areas that I need to improve upon and bringing my musical ability to a whole new level. I'm constantly using the resources, and love the learning and sharing we get from a true online community. Thank you Artistworks!!! One of the best ways to learn I have ever experienced. I tell everyone I come into contact with who is wanting to learn a instrument or to sing to consider artistworks.